Believers, if we are going to endure to the end and stand firm in our faith, we have to realize that we must daily always stay alert because we have an enemy who is constantly trying to cause us to fall. In today’s verse we see that we must be able to stand against the “wiles of the devil”. Wiles is defined as: cunning arts, deceit, craft, trickery. It means that the devil is always following us around, lying in wait, trying to trip us up, trying to cause us waver in our faith, trying to trick us or lead us astray. 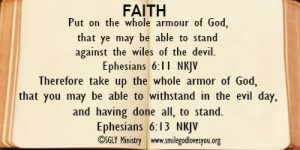 He is very crafty and cunning and so that is why God says we need to put on the whole armour, so that every part of us is covered daily and in that way we can stand firm. This week lets memorize these two verses and also take action to do them daily, so that we will be found standing, strong in our faith, when Christ returns. If you would like to Print Out these Verses to post someplace to help you memorize them just click on the Memory Verse Card below.